It may seem contradictory to say spend and grow rich. Years ago I started asking the question why do some people spend and grow rich while others spend and grow poor? The answer I found wasn’t in the amount of money a person received but rather how they related to those dollars that made the difference. Another part of the answer was in the definition of rich. As a former financial planner I found that the terms rich and financial freedom were used a lot. Virtually everyone in the US controls over $1 million during their working life. So what gets in the way of anyone becoming rich? I believe there are two main reasons. The first reason is our beliefs about money. Money is somehow bad or the “root of all evil”. If we accumulate money someone or some event will take it from us. We simply don’t deserve to be rich. The second reason is that we don’t have a plan about what to do with money when we receive it. We’re not taught how to handle money. To overcome our negative beliefs about money we have to first understand what money is. At my boot camps and during many of my talks I ask the audience if money is logical or emotional. The normal response is 50% say logical and 50% say emotional. I then pull out a $100 bill and asked the question again. Now the response is over 90% emotional. In reality is a $100 bill is simply a piece of paper with ink on it without the ability to be either emotional or logical. I describe it as a chameleon. If we treat money logically it treats us back logically and if we treat it emotionally it treats us back emotionally. The second obstacle to becoming rich is we do not have a plan on how to handle money. My mother was a bank officer and my father owned businesses, but neither one of them taught me a process on how to handle money. Early in my own business career I realized that I needed a system to manage money. I used different budget programs that were available, but was frustrated because they always seemed to be off every month. Because I could not find a money management program that was flexible, I created one. I call it the Two-Tier System, it is a spending plan not a budget. I have used and taught this system to my clients for the last 30 years and ultimately wrote the book Spend and Grow Rich- The Two-Tier System. Tier 1 looks much like a normal budget. You write down all of your predictable expenses per month with a dollar value for each expense. You want the total amount in tier 1 to be as low as possible while still meeting all of your needs. By making the total dollar allocation low, as soon as that amount of money comes in you can relax because you know your basic needs have been covered. Tier 2 is where the magic happens. After all of the basic expenses are covered every month all additional dollars flow into tier 2 where you pick 8 to 10 categories for the Tier 2 money to be allocated into. The difference between tier 1 and tier 2 is that in tier 2 each category is given a percentage value. Because the dollars are allocated by percentage there is no way that you can overspend the two-tier system. Set up your two-tier system during daylight. Dealing with finances can be stressful and doing it at night can intensify those feelings. In tier 1 you want enough dollars allocated to meet your needs. Don’t be too cheap. Debt took a while to come on and it will take a while to come off. Systematic debt reduction allows you to build habits where the debt will not reappear. If you own a business set up a two-tier system for the business separate from your personal. Everyone involved with the dollars has to be on board to work the program. Commit to use the two-tier system for a minimum of six months. 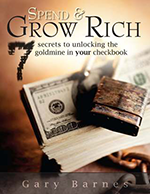 Spend and Grow Rich – the Two-Tier System is the complete blueprint on how to set up your personal two-tier spending plan. Click here to receive your copy. I know that if you embrace the two-tier system you will finally gain control of your finances and you will learn how to Spend and Grow Rich!